Normal properties in an object—that is, mappings from string keys to values. Named data properties include methods. This is by far the most common kind of property. Special methods whose invocations look like reading or writing properties. Normal properties are storage locations for property values; accessors allow you to compute the values of properties. They are virtual properties, if you will. See Accessors (Getters and Setters) for details. Use this in methods to refer to the current object (also called the receiver of a method invocation). ECMAScript 5 allows a trailing comma (after the last property) in an object literal. Alas, not all older browsers support it. A trailing comma is useful, because you can rearrange properties without having to worry which property is last. The dot operator provides a compact syntax for accessing properties. The property keys must be identifiers (consult Legal Identifiers). If you want to read or write properties with arbitrary names, you need to use the bracket operator (see Bracket Operator (): Accessing Properties via Computed Keys). If a property doesn’t exist yet, setting it automatically creates it. If a property already exists, setting it changes its value. delete affects only the direct (“own,” noninherited) properties of an object. Its prototypes are not touched (see Deleting an inherited property). delete returns false if the property is an own property, but cannot be deleted. It returns true in all other cases. Following are some examples. While the dot operator works with fixed property keys, the bracket operator allows you to refer to a property via an expression. Note that the preceding function creates an object if value isn’t an object. You can implement the same function without doing that, via typeof (see Pitfall: typeof null). In the case of methods, the value of this is called the receiver of the method call. For the second invocation, you need to repeat jane, because call() doesn’t know how you got the function that it is invoked on. For the second invocation, you need to repeat jane, because apply() doesn’t know how you got the function that it is invoked on. apply() for Constructors explains how to use apply() with constructors. Alas, here apply() does not work, because it helps only with function or method calls, not with constructor invocations. We can simulate apply() in two steps. The preceding code uses bind() to create a constructor without parameters and invokes it via new. // and prevent `this` from being the result? The preceding code does not work for most built-in constructors, which always produce new instances when called as functions. In other words, the step in line (1) doesn’t set up inst as desired. The reason is that when we call the strict mode function func2, this is undefined, resulting in an error. > counter.count  // it worked! Each call to bind() creates a new function. That has consequences when you’re registering and unregistering callbacks (e.g., for event handling). You need to store the value you registered somewhere and use it for unregistering, too. There are three ways to work around this problem. The prototype relationship between two objects is about inheritance: every object can have another object as its prototype. Then the former object inherits all of its prototype’s properties. An object specifies its prototype via the internal property [[Prototype]]. Every object has this property, but it can be null. The chain of objects connected by the [[Prototype]] property is called the prototype chain (Figure 17-1). Figure 17-1. A prototype chain. The object obj inherits the property describe from proto. It also has a so-called own (noninherited, direct) property, name. Inside describe(), this is obj, which allows the method to access obj.name. That is similar to how overriding of methods works in class-based languages. Both objects are persons. Their name property is different, but we could have them share the method describe. We do that by creating a common prototype called PersonProto and putting describe into it (Figure 17-2). Figure 17-2. The objects jane and tarzan share the prototype PersonProto and thus the property describe. In the preceding code, we called the method Object.prototype.hasOwnProperty generically (see Generic Methods: Borrowing Methods from Prototypes). __proto__ is pronounced “dunder proto,” an abbreviation of “double underscore proto.” That pronunciation has been borrowed from the Python programming language (as suggested by Ned Batchelder in 2006). Special variables with double underscores are quite frequent in Python. However, more and more engines are adding support for __proto__ and it will be part of ECMAScript 6. Only getting a property considers the complete prototype chain of an object. Setting and deleting ignores inheritance and affects only own properties. The rationale is that prototype properties are meant to be shared by several objects. This approach allows us to nondestructively “change” them—only the current object is affected. For more information on the delete operator, consult Deleting properties. An own property of an object is stored directly in that object. An inherited property is stored in one of its prototypes. The enumerability of a property is an attribute (see Property Attributes and Property Descriptors), a flag that can be true or false. Enumerability rarely matters and can normally be ignored (see Enumerability: Best Practices). You can list own property keys, list all enumerable property keys, and check whether a property exists. The following subsections show how. Object.getOwnPropertyNames(obj) returns the keys of all own properties of obj. Object.keys(obj) returns the keys of all enumerable own properties of obj. Note that properties are normally enumerable (see Enumerability: Best Practices), so you can use Object.keys(), especially for objects that you have created. If you want to list all properties (both own and inherited ones) of an object, then you have two options. to iterate over the keys of all enumerable properties of object. See for-in for a more thorough description. Returns true if obj has a property whose key is propKey. Inherited properties are included in this test. Returns true if the receiver (this) has an own (noninherited) property whose key is propKey. Object.defineProperties() is explained in Getting and Defining Properties via Descriptors, but it should be fairly obvious how it works: proto has the own properties protoEnumTrue and protoEnumFalse and obj has the own properties objEnumTrue and objEnumFalse (and inherits all of proto’s properties). Among property-related operations, enumberability only influences the for-in loop and Object.keys() (it also influences JSON.stringify(), see JSON.stringify(value, replacer?, space?)). ECMAScript 5 lets you write methods whose invocations look like you are getting or setting a property. That means that a property is virtual and not storage space. You could, for example, forbid setting a property and always compute the value returned when reading it. Property attributes and property descriptors are an advanced topic. You normally don’t need to know how they work. Property attributes are the atomic building blocks of properties. A property descriptor is a data structure for working programmatically with attributes. All of a property’s state, both its data and its metadata, is stored in attributes. They are fields that a property has, much like an object has properties. Attribute keys are often written in double brackets. Attributes matter for normal properties and for accessors (getters and setters). [[Value]] holds the property’s value, its data. [[Writable]] holds a boolean indicating whether the value of a property can be changed. [[Get]] holds the getter, a function that is called when a property is read. The function computes the result of the read access. [[Set]] holds the setter, a function that is called when a property is set to a value. The function receives that value as a parameter. [[Enumerable]] holds a boolean. Making a property nonenumerable hides it from some operations (see Iteration and Detection of Properties). These defaults are important when you are creating properties via property descriptors (see the following section). All attributes of a property are returned as a descriptor. I usually don’t rely on the defaults and explicitly state all attributes, to be completely clear. The copy must have the same prototype (see Layer 2: The Prototype Relationship Between Objects) as the original. The copy must have the same properties, with the same attributes as the original. Get an array with the keys of all own properties of source. Use that property descriptor to create an own property in target. Note that this function is very similar to the function _.extend() in the Underscore.js library. Defining a property via defineProperty() and defineProperties() (see Getting and Defining Properties via Descriptors). Assigning to a property via =. Defining a property means creating a new own property or updating the attributes of an existing own property. In both cases, the prototype chain is completely ignored. If prop is a setter (own or inherited), call that setter. Otherwise, if prop is read-only (own or inherited), throw an exception (in strict mode) or do nothing (in sloppy mode). The next section explains this (slightly unexpected) phenomenon in more detail. Otherwise, if prop is own (and writable), change the value of that property. Otherwise, there either is no property prop, or it is inherited and writable. In both cases, define an own property prop that is writable, configurable, and enumerable. In the latter case, we have just overridden an inherited property (nondestructively changed it). In the former case, a missing property has been defined automatically. This kind of autodefining is problematic, because typos in assignments can be hard to detect. This fits with the idea that assignment changes inherited properties, but nondestructively. If an inherited property is read-only, you want to forbid all changes, even nondestructive ones. The main purpose of enumerability is to tell the for-in loop which properties it should ignore. As we have seen just now when we looked at instances of built-in constructors, everything not created by the user is hidden from for-in. For your own code, you can usually ignore enumerability and should avoid the for-in loop (Best Practices: Iterating over Arrays). You normally shouldn’t add properties to built-in prototypes and objects. But if you do, you should make them nonenumerable to avoid breaking existing code. prevents extensions and makes all properties “unconfigurable.” The latter means that the attributes (see Property Attributes and Property Descriptors) of properties can’t be changed anymore. For example, read-only properties stay read-only forever. Additionally, obj has the prototype Object.prototype, which is also mutable. A constructor function (short: constructor) helps with producing objects that are similar in some way. It is a normal function, but it is named, set up, and invoked differently. This section explains how constructors work. They correspond to classes in other languages. Data is instance-specific and stored in the own properties of the instance objects (jane and tarzan in the preceding example). Behavior is shared by all instances—they have a common prototype object with methods (PersonProto in the preceding example). First the behavior is set up: a new object is created whose prototype is Person. prototype. Then the data is set up: Person receives that object as the implicit parameter this and adds instance properties. Figure 17-3 shows what the instance jane looks like. The property constructor of Person.prototype points back to the constructor and is explained in The constructor Property of Instances. 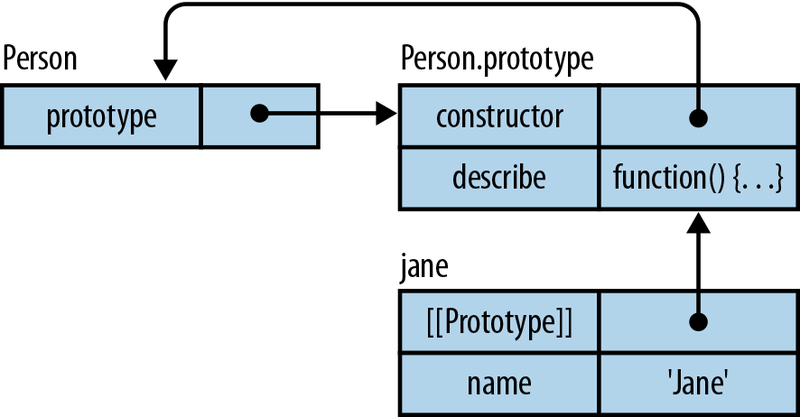 Figure 17-3. jane is an instance of the constructor Person; its prototype is the object Person.prototype. In line (1), you can see that the prototype of an instance created by a constructor Constr is Constr.prototype. Line (2) reveals another feature of the new operator: you can return an arbitrary object from a constructor and it becomes the result of the new operator. This is useful if you want a constructor to return an instance of a subconstructor (an example is given in Returning arbitrary objects from a constructor). In the preceding example, proto is the prototype of obj. Thus, instance prototype is the best option. This approach detects only direct instances of a given constructor. In contrast, instanceof detects both direct instances and instances of all subconstructors. The call in line (1) works, because extend sets Sub.superclass to Super.prototype. Thanks to the constructor property, you can call the superconstructor as a method. The instanceof operator (see The instanceof Operator) does not rely on the property constructor. This pitfall is not a deal-breaker for most use cases for instanceof, but you have to be aware of it. Obviously, this is also an issue with non-built-in constructors. Avoid objects crossing realms. Browsers have the postMessage() method, which can copy an object to another realm instead of passing a reference. value.isT(): The prototype of T instances must return true from this method; a common superconstructor should return the default value, false. &apos;T&apos; in value: You must tag the prototype of T instances with a property whose key is &apos;T&apos; (or something more unique). value.TYPE_NAME === &apos;T&apos;: Every relevant prototype must have a TYPE_NAME property with an appropriate value. This section gives a few tips for implementing constructors. var c = SloppyColor(&apos;green&apos;); // no warning! This section explains that in most cases, you should not put data in prototype properties. There are, however, a few exceptions to that rule. Prototypes contain properties that are shared by several objects. Hence, they work well for methods. Additionally, with a technique that is described next, you can also use them to provide initial values for instance properties. I’ll later explain why that is not recommended. The parameter data is optional. If it is missing, the instance does not get a property data, but inherits Names.prototype.data instead. In the preceding example, push() changed the array in Names.prototype.data. Since that array is shared by all instances without an own property data, n2.data’s initial value has changed, too. Obviously, the problem of modifying a shared default value does not arise if that value is immutable (as all primitives are; see Primitive Values). But for consistency’s sake, it’s best to stick to a single way of setting up properties. I also prefer to maintain the usual separation of concerns (see Layer 3: Constructors—Factories for Instances): the constructor sets up the instance properties, and the prototype contains the methods. ECMAScript 6 will make this even more of a best practice, because constructor parameters can have default values and you can define prototype methods via classes, but not prototype properties with data. Obviously, that is quite a bit of work, so you have to be sure it is worth it. If the same property (same key, same semantics, generally different values), exists in several prototypes, it is called polymorphic. Then the result of reading the property via an instance is dynamically determined via that instance’s prototype. Prototype properties that are not used polymorphically can be replaced by variables (which better reflects their nonpolymorphic nature). Thanks to the polymorphic “tag” TYPE_NAME, you can distinguish the instances of ConstrA and ConstrB even when they cross realms (then instanceof does not work; see Pitfall: crossing realms (frames or windows)). Additionally, I will explain how to keep global data private via IIFEs. Values stored in properties (either in the instance or in its prototype) are publicly accessible. Data and functions stored in the environment are private—only accessible to the constructor and to the functions it created. Private functions can access public properties, but public methods in the prototype can’t access private data. We thus need privileged methods—public methods in the instance. Privileged methods are public and can be called by everyone, but they also have access to private values, because they were created in the constructor. Figure 17-4. When a constructor Constr is invoked, two data structures are created: an environment for parameters and local variables and an instance to be initialized. The following sections explain each kind of value in more detail. // Can’t put methods in the prototype! Mediating access to private data via privileged methods introduces an unnecessary indirection. Privileged methods and private functions both destroy the separation of concerns between the constructor (setting up instance data) and the instance prototype (methods). There is no way to access the environment’s data from outside, which makes this solution secure if you need that (e.g., for security-critical code). On the other hand, private data not being accessible to the outside can also be an inconvenience. Sometimes you want to unit-test private functionality. And some temporary quick fixes depend on the ability to access private data. This kind of quick fix cannot be predicted, so no matter how good your design is, the need can arise. Keeping the environment around and putting privileged methods in instances costs memory. Again, be sure it really matters for your code and measure. For most non-security-critical applications, privacy is more like a hint to clients of an API: “You don’t need to see this.” That’s the key benefit of encapsulation—hiding complexity. Even though more is going on under the hood, you only need to understand the public part of an API. The idea of a naming convention is to let clients know about privacy by marking the key of a property. A prefixed underscore is often used for this purpose. Being able to access private and public data in the same manner is more elegant than using environments for privacy. Properties with marked keys can be seen everywhere. The more people use IDEs, the more it will be a nuisance that they are shown alongside public properties, in places where they should be hidden. IDEs could, in theory, adapt by recognizing naming conventions and by hiding private properties where possible. That can be useful for unit tests and quick fixes. Additionally, subconstructors and helper functions (so-called “friend functions”) can profit from easier access to private data. The environment approach doesn’t offer this kind of flexibility; private data can be accessed only from within the constructor. Keys of private properties can clash. This is already an issue for subconstructors, but it is even more problematic if you work with multiple inheritance (as enabled by some libraries). With the environment approach, there are never any clashes. We have wrapped an IIFE around StringBuilder so that the constant KEY_BUFFER stays local and doesn’t pollute the global namespace. Long keys with UUIDs make key clashes virtually impossible. This subsection explains how to keep global data private to singleton objects, constructors, and methods, via IIFEs (see Introducing a New Scope via an IIFE). Those IIFEs create new environments (refer back to Environments: Managing Variables), which is where you put the private data. Note that if you are using a module system (see Chapter 31), you can achieve the same effect with cleaner code by putting the constructor plus methods in a module. Ensuring that instanceof works: if sub is an instance of Sub, we also want sub instanceof Super to be true. Overriding a method to adapt one of Super’s methods in Sub. Making supercalls: if we have overridden one of Super’s methods, we may need to call the original method from Sub. Figure 17-5. Sub should inherit from Super: it should have all of Super’s prototype properties and all of Super’s instance properties in addition to its own. Note that methodB overrides Super’s methodB. When Sub is invoked via new, its implicit parameter this refers to a fresh instance. It first passes that instance on to Super (1), which adds its instance properties. Afterward, Sub sets up its own instance properties (2,3). The trick is not to invoke Super via new, because that would create a fresh superinstance. Instead, we call Super as a function and hand in the current (sub)instance as the value of this. Shared properties such as methods are kept in the instance prototype. Thus, we need to find a way for Sub.prototype to inherit all of Super.prototype’s properties. The solution is to give Sub.prototype the prototype Super.prototype. Confused by the two kinds of prototypes? Object.create() produces a fresh object whose prototype is Super.prototype. Afterward, we add Sub’s methods. As explained in The constructor Property of Instances, we also need to set up the property constructor, because we have replaced the original instance prototype where it had the correct value. Figure 17-6 shows how Sub and Super are related now. Sub’s structure does resemble what I have sketched in Figure 17-5. The diagram does not show the instance properties, which are set up by the function call mentioned in the diagram. Figure 17-6. The constructor Sub inherits the constructor Super by calling it and by making Sub.prototype a prototypee of Super.prototype. “Ensuring that instanceof works” means that every instance of Sub must also be an instance of Super. 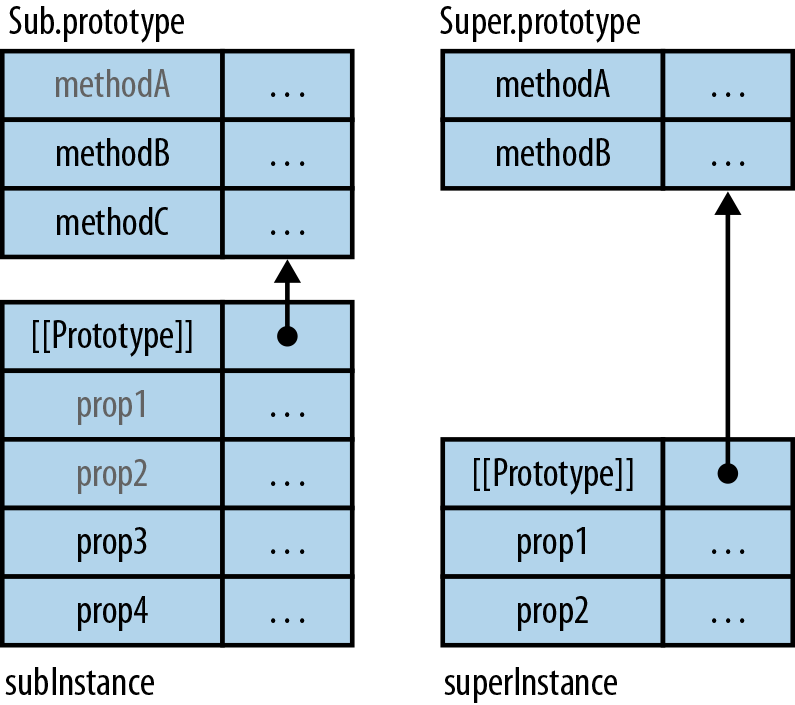 Figure 17-7 shows what the prototype chain of subInstance, an instance of Sub, looks like: its first prototype is Sub.prototype, and its second prototype is Super.prototype. Figure 17-7. subInstance has been created by the constructor Sub. It has the two prototypes Sub.prototype and Super.prototype. We override a method in Super.prototype by adding a method with the same name to Sub.prototype. methodB is an example and in Figure 17-7, we can see why it works: the search for methodB begins in subInstance and finds Sub.prototype.methodB before Super.prototype.methodB. Start your search “after” (in the prototype of) the home object of the current method. Look for a method whose name is foo. Invoke that method with the current this. The rationale is that the supermethod must work with the same instance as the current method; it must be able to access the same instance properties. 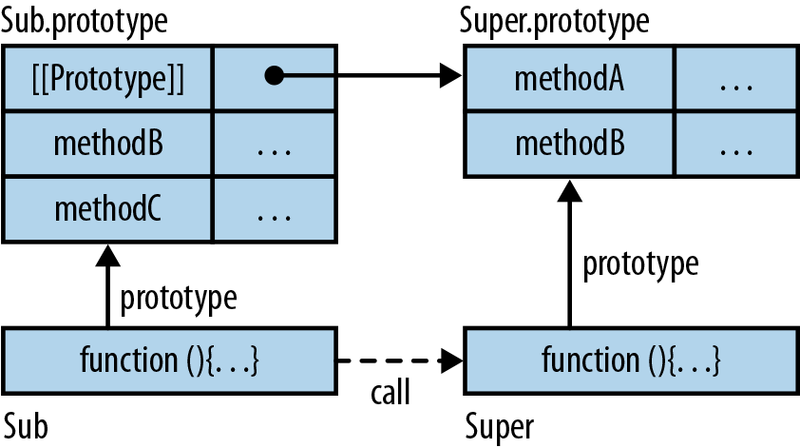 Super.prototype: Start your search in Super.prototype, the prototype of Sub.prototype (the home object of the current method Sub.prototype.methodB). methodB: Look for a method with the name methodB. call(this, ...): Call the method found in the previous step, and maintain the current this. This code uses the helper function copyOwnPropertiesFrom(), which is shown and explained in Copying an Object. Read “subclasses” as a verb: SubC subclasses SuperC. Such a utility function can take some of the pain out of creating a subconstructor: there are fewer things to do manually, and the name of the superconstructor is never mentioned redundantly. The following example demonstrates how it simplifies code. This is not recommended under ECMAScript 5. The prototype will have all of Super’s instance properties, which it has no use for. Therefore, it is better to use the aforementioned pattern (involving Object.create()). 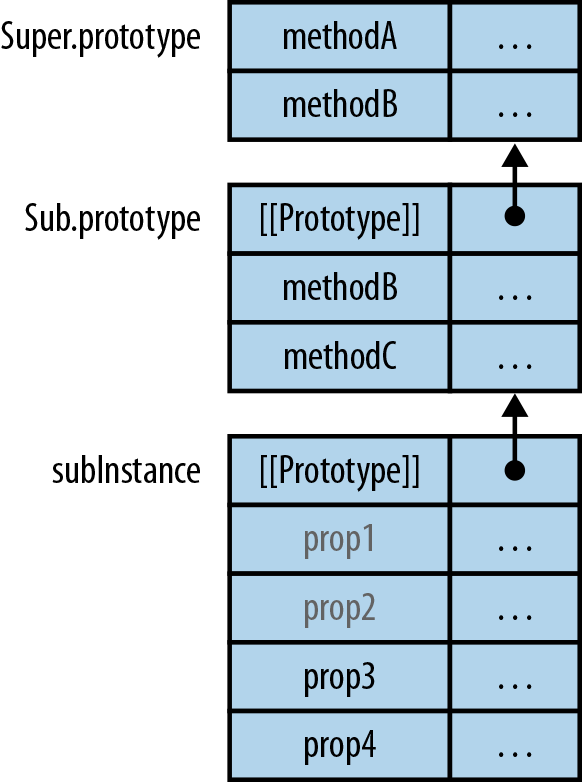 The following subsections describe the methods that Object.prototype provides for its prototypees. The conversion to boolean is not configurable; objects are always considered to be true (see Converting to Boolean). This method returns a locale-specific string representation of an object. The default implementation calls toString(). Most engines don’t go beyond this support for this method. However, the ECMAScript Internationalization API (see The ECMAScript Internationalization API), which is supported by many modern engines, overrides it for several built-in constructors. Returns true if this owns a property whose key is key. “Own” means that the property exists in the object itself and not in one of its prototypes. chablis is the receiver of the method call, passed to incAge via this. 1 is an argument, passed to incAge via years. A function that can be used in this manner is called a generic method; it must be prepared for this not being an instance of “its” constructor. Thus, not all methods are generic; the ECMAScript language specification explicitly states which ones are (see A List of All Generic Methods). The advantage of this pattern is that it is less verbose. But it is also less self-explanatory. Performance should not be an issue (at least long term), as engines can statically determine that the literals should not create objects. This example is about turning an array into arguments, not about borrowing a method from another constructor. An array-like object must have a length property whose value is the number of its elements. Some methods require length to be mutable (for example, reverse()). Values whose lengths are immutable (for example, strings) cannot be used with those methods. Some operations consider the whole prototype chain and see inherited properties. Other operations access only the own (noninherited) properties of an object. obj is an object with one own property whose prototype is proto, which also has one own property. proto has the prototype Object.prototype, like all objects that are created by object literals. Thus, obj inherits properties from both proto and Object. prototype. That is, we want to ignore inherited properties and only consider own properties. Let’s see which read operations interpret obj in this manner and which don’t. Note that for objects-as-maps, we normally want to use arbitrary property keys, stored in variables. That rules out dot notation. It considers inherited enumerable properties. The reason that no properties of Object.prototype show up here is that all of them are nonenumerable. This method returns only enumerable own properties; ownProp has been added via assignment and is thus enumerable by default. If you want to list all own properties, you need to use Object.getOwnPropertyNames(). We have called hasOwnProperty() generically (see Generic Methods: Borrowing Methods from Prototypes). We also need to escape the escaped version of &apos;__proto__&apos; (etc.) to avoid clashes; that is, if we escape the key &apos;__proto__&apos; as &apos;__proto__%&apos;, then we also need to escape the key &apos;__proto__%&apos; so that it doesn’t replace a &apos;__proto__&apos; entry. That’s what happens in line (1). Think this exercise is academic and doesn’t arise in real systems? As observed at a support thread, until recently, on all non-IE browsers, if you typed “__proto__” at the beginning of a new Google Doc, your Google Doc would hang. This was tracked down to such a buggy use of an object as a string map. Such an object is a better map (dictionary) than a normal object, which is why this pattern is sometimes called the dict pattern (dict for dictionary). Let’s first examine normal objects and then find out why prototype-less objects are better maps. Inherited properties (pitfall #1) are not an issue anymore, simply because there are none. Therefore, you can now freely use the in operator to detect whether a property exists and brackets to read properties. But that is not a real disadvantage, because it isn’t safe to directly invoke methods on a dict object anyway. Use the dict pattern for quick hacks and as a foundation for libraries. In (nonlibrary) production code, a library is preferable, because you can be sure to avoid all pitfalls. The next section lists a few such libraries. This section is a quick reference with pointers to more thorough explanations. Using map() in this manner is a tip by Brandon Benvie (@benvie).